"Plan 9 from Las Vegas"
2. Whatcha Wanna Do Now? assistant on a tour stop in Las Vegas). The three encountered each other at the Golden Gate Downtown Casino. had agreed to put something together, but missing was a band!! of Las Vegas...serve that up hot and enjoy! CD!). 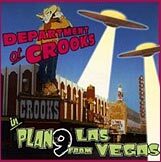 Their debut album "Plan 9 from Las Vegas" is out.